I got a chance to meet Mike and Dave from SpyFu.com while speaking at the BOLO event back in October and really liked their product. So we set up a time for me to talk to their Director of Marketing, Sidra Condron about their use of Social Media. Now for those of you that don’t know SpyFu, it’s a great service that lets you compare competitors organic and pay ad campaigns. It’s extremely useful to help you determine what the competition is doing, the keywords you should be focusing on, what ads are working and more. I’ve used SpyFu to help clients set an overall SEO strategy, educate clients to what their competitors are doing and helping to optimize existing plans. I recommend you give it a try! Now when I arrived at the offices I was greeted by Mike the president of the company and some dogs running around. 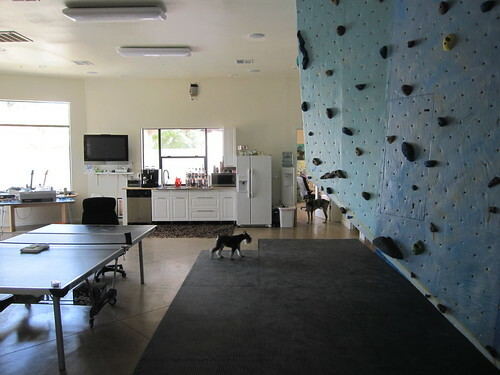 These offices are great, people are happy, they can bring their pet to work and they have the most amazing smore’s flavored coffee! Oh and did I mention the climbing wall in the main open area? Yeah that’s a full on climbing wall! Needless to say this is a fun place to work. What do you think about SpyFu’s approach to Social Media? Would you do things differently?